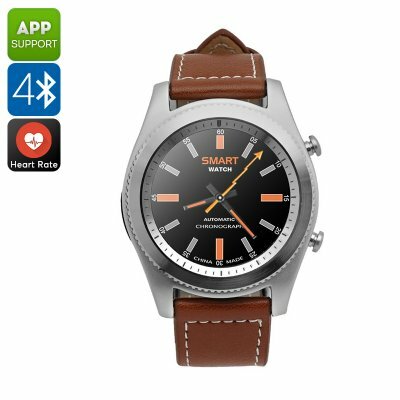 Successfully Added No.1 S9 Bluetooth Watch - Pedometer, Heart Rate, Sedentary Reminder, Bluetooth, Call Answer, 380mAh (Silver) to your Shopping Cart. Bluetooth push notifications and call answering put your smartphone your wrist. The No.1 S9 smart watch has an MTK chipset and a 380mAh built-in battery brings good usage times and as much as 3 days in standby. With its traditions circular screen and metal bezel, this unassuming smart watch looks like an ordinary timepiece. However, dig beneath that stylish exterior and you'll find a wealth of functions that will change the way you interact with your Smartphone. With Bluetooth connectivity, the No.1 S9 smart watch can put all the important info from your phone onto your wrist. Able to sync with your iOS or Android smartphone this Bluetooth watch ensures you won't miss a call as you can answer it from your wrist. It will also inform you of incoming social media and SMS messages. With all this info on your wrist, you can keep your phone hidden away and discreetly check updates and notifications without drawing unwanted attention or disturbing those around you. A 1.3-inch display with 240x240 pixels has all the important info from your phone. The screen also keeps you updated on fitness goals displays heart rate monitor and pedometer readings so you can track and monitor your fitness. With wake up gesturing you only need to tilt your wrist to see new updates and can easy cancel or answer a call with gestures alone. The No.1 S9 smart watch comes with 12 months warranty, brought to you by the leader in electronic devices as well as wholesale Bluetooth watches and cool gadgets..